German Márquez returned to the Rockies’ rotation on Sunday with more than just the Oakland A’s on his mind. A week ago, Márquez was placed on the paternity list so he could be with his pregnant girlfriend, Diluanny, in Venezeula. 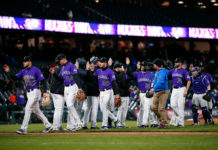 Márquez’s son Damian was born last week, and upon his return to the Rockies, he did both proud — tossing 7-2/3 innings while allowing only two runs and striking out eight in the Rockies’ 3-2 victory. The Rockies raised their record to 16-5 in July, closing within a single game of the NL West lead. 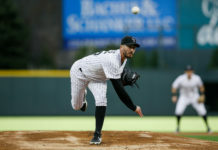 Prior to the game, first baseman Ryan McMahon was called up from Triple-A Albuquerque and paid immediate dividends; hitting a second-inning double and scoring when catcher Tom Murphy blasted a 435-foot home run to center field. 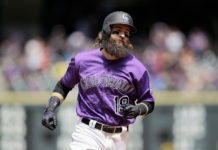 In the third inning, McMahon hit an RBI double that scored shortstop Trevor Story for what turned out to be the Rockies’ final tally of the game. The Rockies’ offense could have put up more runs, but were only 1-for-9 with runners in scoring position on the day. Sluggers Nolan Arenado and Carlos Gonzalez were a combined 0-for-6, but the bottom half of the lineup picked up the offensive slack. 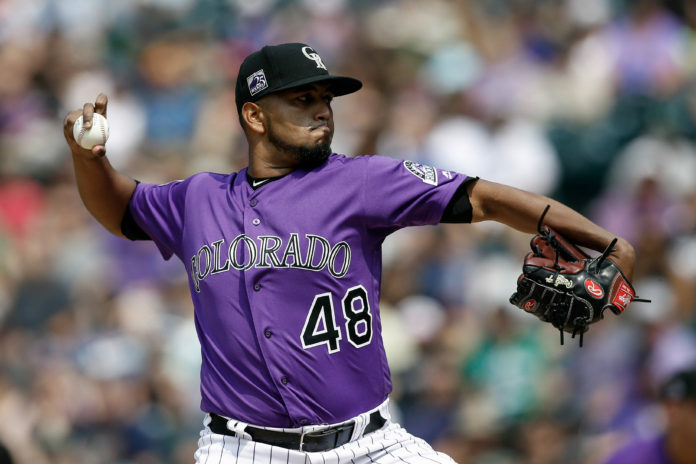 The Rockies’ bullpen was stellar, ensuring that Márquez’s start wasn’t wasted. Scott Oberg relieved Márquez in the eighth to pitch to third baseman Matt Chapman, who homered earlier in the game. Chapman, who was once Arenado’s backup at El Toro High School in Lake Forest, Calif., struck out after a hard-fought, seven-pitch at-bat. Closer Wade Davis pitched a clean ninth inning for the save, retiring the side in only 11 pitches to earn his 30th save of the season in 34 chances. The Rockies, now 10 games over .500 for the first time all season, will travel to St. Louis and Milwaukee this week. The Rockies trail the Brewers by 1-1/2 games in the National League Wild Card race.